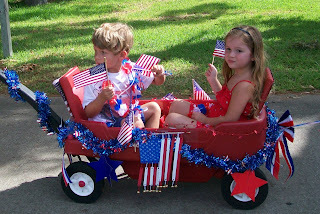 The Garner Family: Happy 4th of July!! 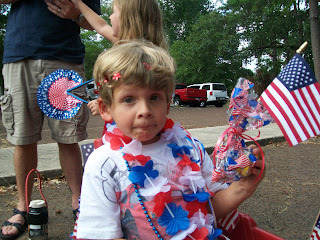 We continued our 4th of July tradition of participating in our neighborhood parade. 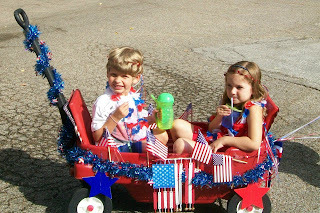 Dawson and Kaelin rode in the wagon again this year, but it's definitely the last year they'll be able to do so - they are so big!!! 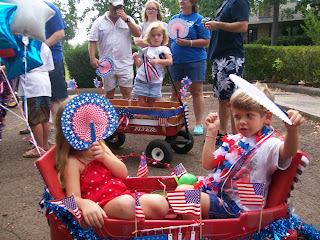 They enjoyed being a part of the parade, waving at the bystanders, and saying, "Happy 4th of July" to everyone. 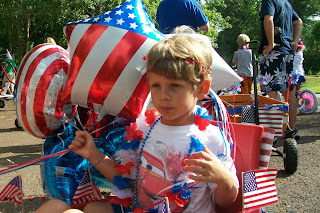 Dawson waiting for the parade to start. 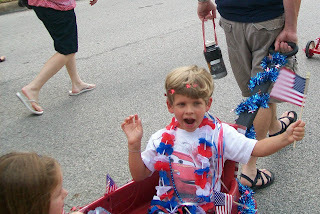 Dawson waving his fan and Kaelin hiding behind hers. Holding onto the balloons. He was so worried that they would float away. Waving at everyone on the side of the road.